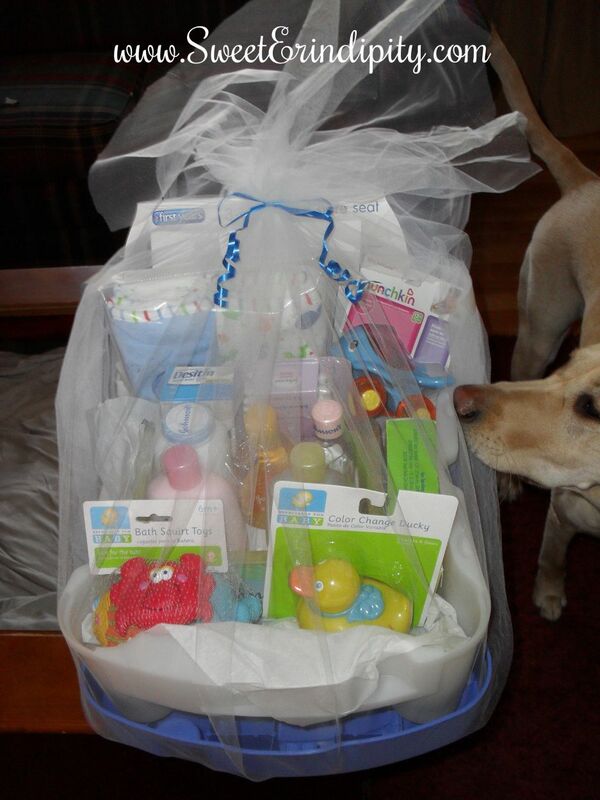 Here is a baby shower gift I put together for my friends Mike & Monique, the same people who got the Duck Towel Cake. I had decided on a bath time theme with this bath seat being the “basket”. Once I decided on the basket type, it was easy – I looked at their registry for all of the bath related items such as cleansers, toys, towels, etc. I used tissue paper as the base in the seat. I love the look of baskets wrapped in tulle instead of cellophane, so I wrapped it up. Looking back I wish I had added a little more dazzle to the bow, but you live and learn. Overall I really like the result…my dog Butters does too!